A Splash of Red: The Life and Art of Horace Pippin by Jen Bryant, illustrated by Melissa Sweet. Grades 2-5. Alfred A. Knopf, January 2013. Unpaged. Review copy provided by my local library. The team that brought us the Caldecott-honor-winning A River of Words: The Story of William Carlos Williams is back with a picture book biography of African-American painter Horace Pippin. Growing up in Pennsylvania, Horace Pippin drew and painted everything around him. No matter what job he was doing, he would always take time to make a picture, using whatever art supplies he had at hand. All that changed when he was injured while fighting overseas during World War I. Shot in the shoulder, Horace wasn't sure he'd ever paint or draw again. With hard work and determination, Horace strengthened his right arm and picked up his art supplies once again, painting the world in natural colors with a splash of red. I just love Melissa Sweet's illustrations and here she pays homage to one of the great American artists by incorporating Horace Pippin's style in some of her spreads. She chooses her colors very carefully in these spreads and depicts scenes that Horace might have chosen to paint: drawing on the floor, students and teacher in a classroom, men packing crates in a warehouse, and other scenes of every day life. Sweet also keeps plenty of spreads in her signature style, creatively and thoughtfully incorporating collage elements and celebrating happy moments with bursts of color. I adore picture book biographies, particularly when they teach me about people I didn't know about before, and this book absolutely fits the bill. 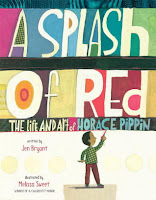 Back matter includes a historical note, an author's note, an illustrator's note, quotation sources, resources for further reading, and a map showing where in the country you can go to view Horace Pippin's artwork. This is a great title to share with young artists and it'll make an excellent addition to Black History Month units. A Splash of Red is on shelves now! Happy Nonfiction Monday! This week's roundup is at Apples With Many Seeds!